Masazo Nonaka, the Japanese man holding the Guinness World Record for longest living male, turned 113 on last Wednesday. He was born in 1905, the same year Albert Einstein published his theory of relativity and Theodore Roosevelt was inaugurated for his second term as the 26th president of the United States. Nonaka grew up in Ashoro, a small town on the Japanese island of Hokkaido, with six brothers and one sister. He married in 1931, had five children, and ran an inn for most of his life, The Washington Post reports. Now in a very long retirement, Nonaka enjoys reading the newspaper, watching samurai and sumo wrestling shows, and looking after his two cats, Haru and Kuro. His secret to longevity? Sweets. It might not be most doctors’ suggestion, but Nonaka says he’s lived such a long life because he soaks in hot springs and eats plenty of sweets. His daughter, however, told Guinness that his long life is due to lack of stress—he lives his life on his own terms. “If he doesn’t want something, he’ll make sure everyone knows about it,” his daughter told Guinness. Nonaka has outlived two of his five children and his wife, Hatsuno, Newsweekreports. He gained the title of oldest living male after the death of Francisco Nuñez Olivera from Spain in January 2018. Olivera was 113 years old. The Post reports Nonaka may not actually be the oldest, as Fredie Blom of South Africa is believed to have celebrated his 114th birthday in May. Guinness told them there is a lot of paperwork involved with confirming a record-holder’s age, and while Blom has not applied for the award, they’d review his eligibility if he did. 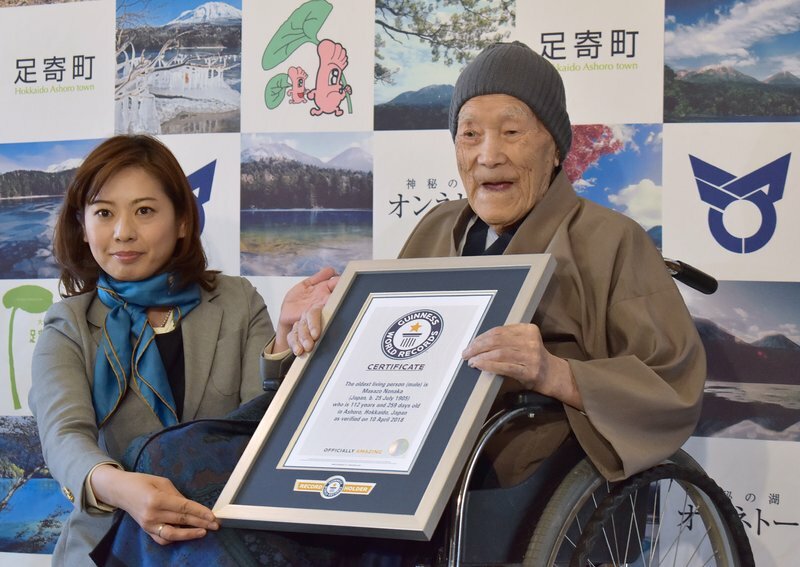 The record-holder for oldest living male ever was Jiroemon Kimura of Japan, who died at age 116 in 2013. The oldest living person was a female, Jeanne Louise Calment of France, who lived 122 years from 1875-1997.